It may not look like a barista is in this box, but Briggo's robot is inside prepping the next espresso shot. Say goodbye to lattes with funky tastes or attitude from coffeehouse baristas. At the University of Texas, a startup called Briggo LLC has installed a coffee kiosk run by a robotic barista in the academic center, which is visited by 10,000 students a day. Designed by Deaton Engineering Inc., the kiosk is segmented into brewed coffee and espresso drinks, and the drinks can also be prepared according to customer milk, syrup, and sweetener preferences. According to founder and CTO Charles Studor, inside the kiosk is a “big industrial machine” with about 250 sensors that mirrors the physical motions of a human barista. With this new “robista”, as its called, Briggo aims to meet the two biggest needs of coffee drinkers: convenience and quality. To get their java jolt, students submit an order online, via mobile, or at the kiosk, and can even receive a text or email when the drink is ready. The brewed coffees take 15-30 seconds to prepare while espresso drinks require about 2 minutes. So customers can easily submit an order and then head to the kiosk to pick up their coffee just as its completed. Each coffee is labeled with the customer’s name and also displayed on the kiosk. 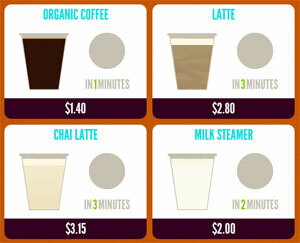 Prices are cheaper than typical coffeehouse prices, and kiosk operators still oversee the flow and refill stock. The touch menu offers a variety of coffee drinks with prices and prep times listed. 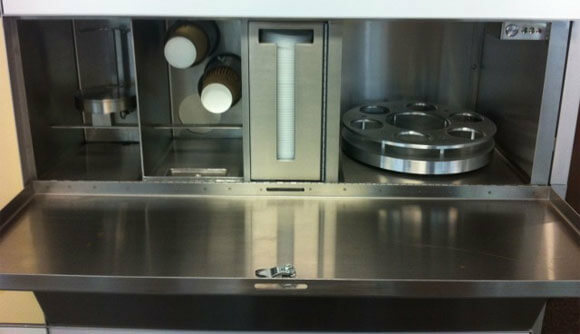 With patents pending, the robot remains behind closed doors, but according to Sprudge, an actual espresso machine is used with a real tamper and steam wind, along with a milk refrigerator. Since the espresso machine hasn’t been re-engineered, in all likelihood Briggo’s automation may be much closer to a “true” robot than what’s going on inside a vending machine. The robot may not be able to prepare espresso that would impress coffee aficionados who pride themselves on perfect crema, but it seems that the 99% are satisfied with what they pay for. Perhaps that’s because the Director of Coffee and Kiosk Operations is Patrick Pierce, an award winning barista. Briggo brought Pierce on as a consultant at first to understand exactly what Pierce does when he pulls espresso, so that an automated system could be designed to perform each step. Studor said, “We’re taking a nationally recognized barista and mimicking what he’s doing, consistently.” The system is designed so that each variable that goes into the perfect coffee can be adjusted, just as in a manufacturing process. Along with former CEO of Dell Financial Services, Kevin Nater, and CIO John Craparo, who worked at GE, the Briggo team initially raised $5 million in funding and is using its connections in technology to prepare for expansion. The Briggo logo is a reminder of the robotic love in each cup. The startup has a vision to introduce robot kiosks into other universities as well as places with clientele similar to the up-all-night college students, such as convention centers, hospitals, courthouses, and transportation centers, like airports and train stations. In other words, primo real estate. They also are working on a smaller version, with the possibility of franchising to build the brand. Now, maybe you’re thinking: Sure coffee’s a big deal, but “robotic manufacturing” big? Even with all the coffee available through coffeehouses, kiosks, fast food places, convenience stores, vending machines, and home brewers, it’s still easy to underestimate the size of the coffee industry. The world’s most traded commodity is oil, but second is coffee. More than 400 million cups of coffee are consumed globally each day, and in the U.S, coffee is a $19 billion dollar a year industry, the eighth highest globally with the average American drinking 3 cups a day. Coffee is about as big of a business as they come, so it’s a perfect place for an innovative startup to bring the power of technology, and the reason is simple: it’s what brought customers back to Starbucks. Starbucks, once claimed #7 in 2008 on CNN Money’s 100 Best Companies To Work For but dropped to #98 last year, in part because it lost some of its luster from years gone by. That’s why the company has actively embraced technology, such as mobile payments and free Wi-Fi, in addition to social media. For all its increased efforts to be seen as a community-building, technology-embracing, environmentally-responsible, employee-supporting company, it is regarded by many as the McDonald’s of coffeehouses. But Burger King, Wendy’s, and a host of other fast food hamburger joints still get a piece of the pie, but strangely Starbucks stands head-and-shoulders about its coffee competitors. And what has been Starbuck’s traditional selling points? Convenience and quality, exactly what Briggo is aiming to perfect with the robot kiosk. But the elephant in the room is the fear of humans losing jobs to robots. Because of the size of the coffee industry and the fact that coffeehouses have a strong “third place” social element to them that is hard to replicate at a kiosk, human baristas will be around for a while. However, a chain like Starbucks may not be able to remain 100 percent human forever. Perhaps the 2035 logo will be a robotic eye as well? Recently, Starbucks announced it is moving into single-cup brewing machines with its new Verismo line positioned to go up against the popular Keurig machines. So it’s clear that the tried-and-true coffee merchant is open to ideas to expand its brand, and a robotic kiosk might just be the solution it needs to expand into even more locations while downsizing workforce overhead. Briggo may be the first of its kind in the coffee world, but its a triple shot threat that may usher in a future “Battle of the Robistas.” And, as a fair warning, if a robot ever learns to perfect the power-packed and highly addictive Café Cubano, we are all doomed.